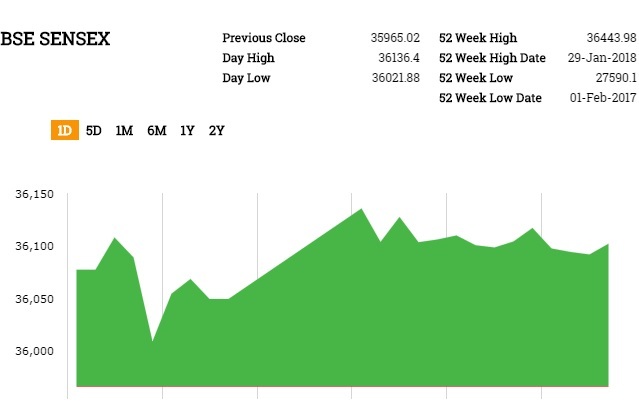 2.45 pm ISTMarket updateBSE Sensex traded higher by 28.26 points, or 0.08%, to 35,993.28, while the Nifty 50 rose 11.75 points, or 0.11%, to 11,039.45. 2.43 pm ISTEicher Motors shares rise over 3% on Jan sales dataEicher Motors Ltd shares rose 3.53% to Rs27900.55 after the company said its January total motorcycle sales rose 31% to 77,878 units. 2.40 pm ISTBHEL approves share repurchaseBharat Electronics Ltd shares traded 3.87% down at Rs162.85. The company said its board approved Rs372 crore share repurchase plan. 1.54 pm ISTCigarette stocks trade higherCigarette stocks trading higher after no major announcement of excise duty hike on cigarettes in the budget so far. ITC Ltd rose 6%, Godfrey Phillips India Ltd 6%. 1.38 pm ISTMarket updateBSE Sensex traded higher by 208.92 points, or 0.58%, to 36,173.94, while the Nifty 50 rose 57.35 points, or 0.52%, to 11,085.05. 1.35 pm ISTMRF shares rise over 1% on higher Q3 profitMRF Ltd reported a profit of Rs341 crore in the December 2017 quarter versus a profit of Rs288 crore in the same period a year ago. December quarter revenue from operations stood at Rs3,799 crore versus Rs3,533 crore a year ago. It has also declared dividend of Rs3 per share. Shares rose 1.32% to Rs69,472. 1.20 pm ISTMarket updateBSE Sensex traded higher by 48.66 points, or 0.14%, to 36,013.68, while the Nifty 50 rose 10.35 points, or 0.09%, to 11,038.05. 12.55 pm ISTRupee falls 0.4% against US dollarRupee fell after local equity markets fell 300 points as the government proposed 10% long term capital gains on equity gains above Rs 100000. At 12.44pm, the home currency was trading at 63.89, down 0.45% from its previous close of 63.59. The local currency opened at 63.70 a dollar and touched a low of 63.91 a dollar. 12.43 pm ISTMarket updateBSE Sensex tanks by 256.69 points, or 0.71%, to 35,708.33, while the Nifty 50 fell 12.90 points, or 0.12%, to 11,014.80, as the government announced long-term capital gains on equities exceeding Rs1 lakh to be taxed at the rate of 10%. 12.40 pm ISTJewellery stocks trade lowerJewellery stocks fell on the announcement of governments intention to formulate a policy for revamping gold monetisation scheme. Tara Jewels fell 1.8%, Gitanjali Gems Ltd declined 0.4%, PC Jeweller Ltd 1.2%, Titan Co Ltd 5%, Thangamayil Jewellery Ltd 3.3%. 12.20 pm ISTSensex, Nifty turn redBSE Sensex traded lower by 47.95 points, or 0.13%, to 35,917.07, while the Nifty 50 fell 17.60 points, or 0.16%, to 11,010.10. 12.17 pm ISTCapital goods, FMCG shares trade higherCapital goods and FMCG shares rose as government focuses on rural and infra push in Budget. L&T rose 3%, Suzlon Energy Ltd rose 2.4%, GMR Infra 2.1%, NCC 2.1%, IRB Infra 1.4%, Bhel up 0.7%, Reliance Infra up 0.3%. GSK Consumer 1.6%, ITC up 1.3%, Britannia Industries Ltd 1%, Godrej Industries Ltd 0.4%, Hindustan Unilever Ltd 0.3%. 11.44 am ISTAgri stocks trade higher as FM proposes to raise MSPAgri related stocks trading higher after the government announced proposal to raise minimum support prices for summer farm harvest season in the budget. Escorts was up 5.1%, JK Agri Genetics 5%, PI Industries 4.9%, NACL Industries 6.8%, Shakti Pumps 4.4%, BASF India 4%, Parag Milk Foods 4.1%, Oswal Greentech 10.3%, Kaveri Seed 3.1%, Monsanto India 4.3%, Rallis India 1.9%, Zuari Agro 2.2%, UPL 1.6%. 11.34 am ISTAvanti Feeds shares jump 11% after FM allocates funds to fisheriesAvanti Feeds surged 11% to Rs2480 after Finance minister said in a budget that the government will spend Rs10,000 crore on aqua, animal husbandry infra. The government said it also extended Kisan Credit cart to fisheries and for animal husbandry. 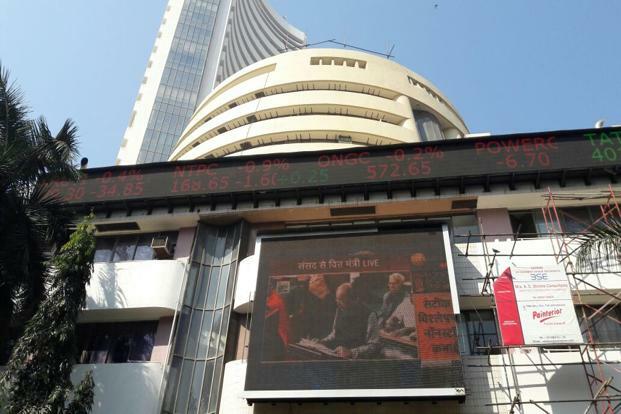 11.25 am ISTSensex, Nifty extend gains as FM starts budget speechBSE Sensex traded higher by 221.90 points, or 0.62%, to 36,186.92, while the Nifty 50 rose 65.05 points, or 0.59%, to 11,092.75. 11.20 am ISTMarket updateBSE Sensex traded higher by 221.90 points, or 0.62%, to 36,186.92, while the Nifty 50 rose 65.05 points, or 0.59%, to 11,092.75. 11.17 am ISTGems and jewellery stocks trade lowerGems and Jewellery stocks trades lower ahead of budget. Analyst expects that the government will announce an import tax cut in its annual budget . Tara Jewels fell 1.8%, Gitanjali Gems Ltd declined 0.2%, PC Jeweller Ltd 1.2%, Titan Co Ltd 3.7%, Thangamayil Jewellery Ltd 2.5%. 10.58 am ISTMarket updateBSE Sensex traded higher by 120.64 points, or 0.34%, to 36,085.66, while the Nifty 50 rose 34.75 points, or 0.32%, to 11,062.45. 10.55 am ISTMetal stocks trade lowerMetal stocks fell. Analyst expects budget to increase import duty on aluminium. It is expected to be raised to 10% from 7.5% and will be positive for Hindalco and Vedanta. Vedanta Ltd fell 2.4%, Coal India Ltd 2.3%, Tata Steel Ltd 1.7%, National Aluminum Corp Ltd 1.7%, Hindustan Zinc 0.7%, Jindal Steel & Power Ltd 0.5%, JSW Steel Ltd 0.5%. 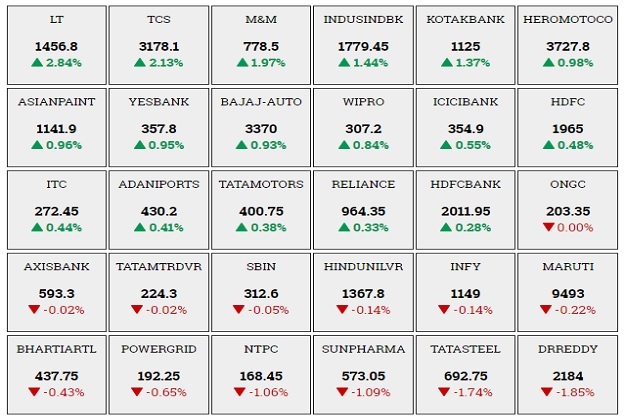 10.30 am ISTTractor makers Mahindra, Escorts stocks rise 3%Tractor makers Mahindra & Mahindra Ltd rose 3% while Escorts Ltd rose 5% ahead of budget. Analyst expects that long-term measures for agriculture sector to push farmer productivity and income levels will be positive for the stocks. 10.27 am ISTHousing finance companies shares trade higherHousing finance companies are in focus ahead of budget, given the Prime Minister emphasis on ‘housing for all by 2022’. Any favourable announcement will boost investor sentiments. GIC Housing Finance Co Ltd rose 1.8%, Repco Home rose 1.6%, LIC Housing Finance 1.5%, Dewan Housing Finance Ltd 1.3%, Housing Development Finance Corp Ltd 0.3%, Can Fin Homes 1%. 10.25 am ISTGE Power India shares fall 4%GE Power India Ltd fell 4.1% to Rs894 after the company reported a net loss of Rs421.30 crore in December quarter against Rs 1214.20 crore a year ago. 10.07 am ISTMarket updateBSE Sensex traded higher by 215.36 points, or 0.60%, to 36,180.38, while the Nifty 50 rose 63.35 points, or 0.57%, to 11,091.05. 10.03 am ISTFortis Healthcare shares drop 4%Fortis Healthcare Ltd shares fell 4% to Rs134.25 after Delhi High Court has allowed Daiichi Sankyo to enforce an international arbitration award here so that it can recover Rs 3,500 crore from former Ranbaxy promoters Malvinder Singh and Shivinder Singh. 9.45 am ISTUnion Budget 2018 LIVE: Arun Jaitley budget speech at 11 amFinance minister Arun Jaitley will present today Union Budget 2018, the Narendra Modi government’s fifth and final full budget. Here are the live updates from parliament. 9.43 am ISTMarket updateBSE Sensex traded higher by 151.59 points, or 0.42%, to 36,116.61, while the Nifty 50 rose 37.95 points, or 0.34%, to 11,065.65. 9.28 am ISTLT shares gain over 2% after Q3 resultLarsen and Toubro Ltd rose 2.4% to Rs1,450.05 after the company said its net profit rose 53% from a year ago, as revenues increased due to higher order inflow from infrastructure and hydrocarbons businesses. Consolidated net profit for the quarter ended 31 December rose to Rs1,490 crore from Rs972 crore a year earlier. Gross revenue rose 9.4% to Rs28,747 crore. 9.25 am ISTIIFL Holdings shares jump 6%IIFL Holdings Ltd shares rose 6% to Rs768 after the company said it will demerge and list as three separate business—wealth, capital markets and NBFC. 9.23 am ISTVakrangee shares tank 20%Vakrangee Ltd shares hit another 20% lower circuit to Rs302. According to a news report, market regulator Sebi is investigating an alleged share price and volume manipulation. 9.22 am ISTRupee opens lower against US dollarThe Indian rupee weakened against US dollar ahead of the announcement of the Union budget for fiscal 2018-19. The local currency opened at 63.70 a dollar, and was trading at 63.68, down 0.13% from its previous close of 63.59. India’s 10-year bond yield was at 7.44% from its Wednesday’s close of 7.43%.